Its summer time once more and the grass is growing back like crazy. In the battle to trim and maintain your lawn, using the right tools makes the difference. However, with numerous trimmer options available on the market, it becomes pretty hard to determine which machine will work best for you. With various models such as cordless trimmers and gas trimmers readily available in most stores, this article will provide in-depth information regarding each of these models to make you fully informed before making your purchase. Unlike traditional gas and corded trimmers, the cordless version of trimmers is the perfect alternative for people looking for classic products to suit the digital age. 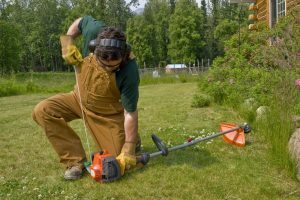 With a distinct advantage over their old predecessors, cordless trimmers are light, portable, easy to take from every corner of your lawn and above all, relatively affordable. Cordless trimmers use only batteries which are cheap and easy to replace and are easy to maintain compared to gas trimmers which requires you to mix gas and oils. Cordless trimmers are available in a number of models. Some of these models use modular batteries while others use integrated batteries. To help you understand more about these models, let’s take a tour and review some of the top cordless trimmers on the market. With approximately 106 years of experience in the market, Black & Decker is among the leading companies with vast experience in designing power tools and outdoor yard care equipment. The LST140C 40V Max Lithium String Trimmer is among the company’s latest innovations. Power drive high-torque transmission gives you cutting power at the string for clean, fast cuts. This tool is sleek, light and easy to use, making it ideal to trim profile corners where mowers can’t reach. It has a power drive transmission, a power command option and an automatic feed spool which gives all the comfort you require when trimming. 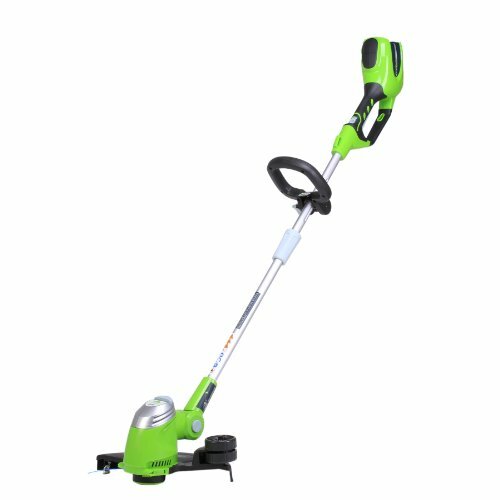 Also known as G-MAX, the GreenWorks Cordless Trimmer is among the best trimmers to consider for home use. It has a 40V battery which fits in two other models—the 29262 and the 29472—making it a perfect choice. The GreenWorks has a number of outstanding features that elevate its name to the top of the competition. 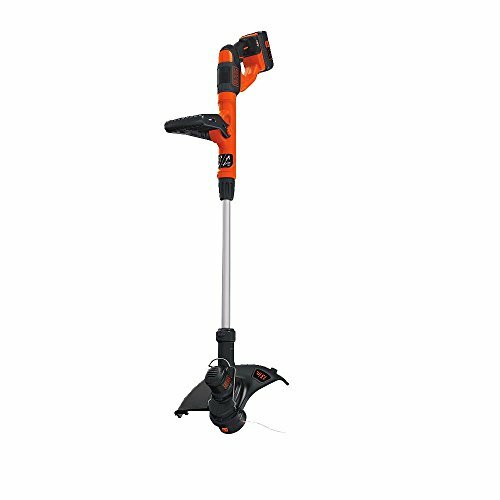 Among them are the adjustable telescopic shaft which makes the tool ideal for taller guys; a pivotal head which converts it from a grass trimmer to an edger; and a manageable weight of 8.5 pounds. Cordless trimmers are easy to maintain since they eliminate the dubious task of mixing gas and oil. They don’t require a lot of routine cleaning and maintenance as compared to their gas counterparts. They’re safe to use since they produce no fumes due to combustion. Cordless trimmers are time consuming. This is because, after trimming an average portion, the battery runs low and has to be recharged before you can continue. According to most customers, the cordless trimmer versions are more expensive as compared to gas models. Although there are many bells and whistles which come with cordless trimmers, customers are required to observe a number of things before making their purchase. These include: battery life, battery compatibility with similar tools, and portability. Some models come with batteries which last for a very short time while others models appear heavier than others. Of all types of trimmers on the market, gas trimmers are the most powerful. These trimmer models are mostly considered for large properties which cordless or electric trimmers can’t manage. 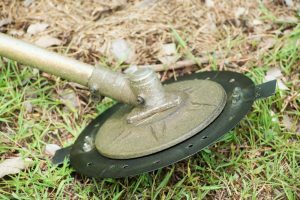 Gas trimmers are also the best options in gardens with extra-tough weeds and grass which require a heavy-duty machine to bring them down. Although these tools are messy and environmentally unfriendly, they’re the most powerful and perfect alternatives for removing taller weeds. To help you make an educated move when making your purchase, we have reviewed two of the best gas trimmers on the market. 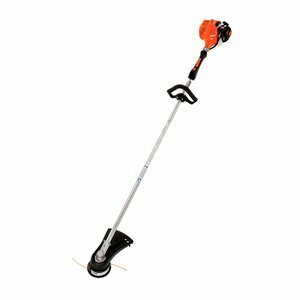 Having been welcomed with a 3.5 star rating from 50 verified customers, the SRM-225 String Trimmer is the perfect tool for trimming large areas of land. This trimmer has a straight shaft with a 17 inch cutting path and dual cutting lines. It has a 21.2cc engine which holds gas and oil combustion for 300 hours. The SRM-225 String Trimmer has a powerful 2-stroke engine, lightweight design and uses the i-30 starting technology. 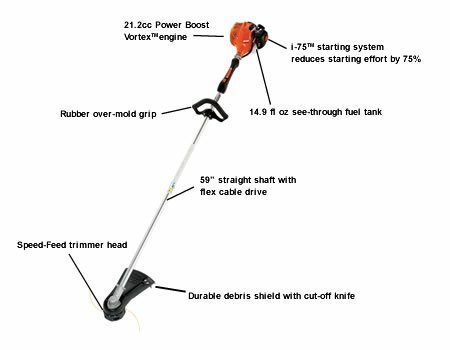 An upgraded version of the SRM-225, the ECO SRM-225i Commercial Grade String Trimmer is the best choice for trimming tall weeds and rough grass. This machine is designed with a large 21.2 carburetor, a 14.9 inch shaft and a 2-stroke engine for an outstanding output. According to most customers, the ECO SRM-225i has managed to meet state emissions regulations. Its powerful engine and strong shaft are other added benefits which ensure that the trimming process is done fast and perfectly. However, the only limitation with the ECO SRM-225i is the 12 pound weight which, according to most customers, is quite bulky as compared to the competition. Perfect for trimming big yards. They’re more powerful compared to corded or cordless trimmers. They don’t require a cord since they rely on gas and oil combustion. They’re very loud and require ear protection gadgets. The gas and oil combustion releases fumes which pollute the environment. If you decide to go the gas trimmer way, you’ll have to choose between a 2-cycle engine and a 4-cycle engine. While the former is available at a cheaper price, the latter is much more expensive and is the best for trimming tall weeds and grass. Now that we’ve laid out the pros, cons and final verdict for each side, it’s upon you now to make an informed decision on what’s best for you. Some of the things you’re required to look for before selecting a trimmer include the size of your yard; the type of terrain; and your ability to tolerate noise and pollution. Whichever model you purchase, always remember to test before buying.